Wholesum announced it is preparing for a very fruitful month for organic Chilean blueberries. Availability of organic Chilean blueberries has been on an upward trend and will have the highest spike between February and March of 2019 for Wholesum. The bulk of organic blueberries will come from their partner grower Valles del Sur SpA in Vilcun, Chile which has been fair trade certified by Fair Trade USA since 2018 and through FLOCERT since 2016. Fair Trade product from Chile is a cornerstone of Wholesum’s blueberry program. “We are very excited about a successful season of organic Fair Trade blueberries in partnership with Valles del Sur SpA. Wholesum has been very dedicated to spreading the mission of Fair Trade since our certification through Fair Trade USA in 2012. We anticipate that organic blueberry sales this season will greatly contribute to the worker community at Valles del Sur SpA,” says Ricardo Crisantes, Chief Commercial Officer of Wholesum. Ricardo Crisantes of Wholesum (left), meets with Santiago Farah, CEO of Valles del Sur SpA. Last year Wholesum created partnerships with organic berry growers in North and South America with a goal to build a program consisting of visionary growers who also seek a fair and equitable world. The sales of Fair Trade products like Wholesum’s blueberries go towards community development funds which help fund projects voted for by the worker community in Vilcun. According to the company, since being Fair Trade certified, blueberry sales have helped fund dental and vision care for workers and their families, supplies to prepare children for school, facility improvements in two primary schools, emergency funds for families who lost homes to fire and other projects of this nature. Santiago Farah, CEO of Valles del Sur SpA, has also been an advocate on the Fair Trade partnership with Wholesum. 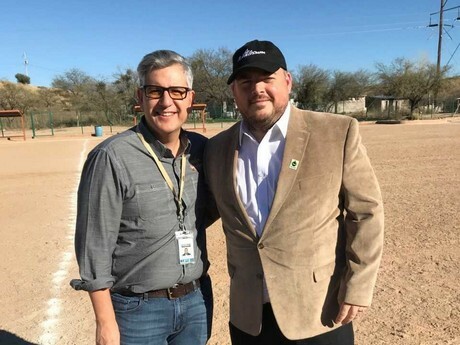 This January, Farah visited Wholesum Farms in Arizona and Sonora where he was able to connect with the Fair Trade committees and tour the project at each location. Farah and Crisantes engaged in an exchange of ideas regarding fair trade at this meeting and hope to continue building upon the foundation they have established. Wholesum’s said its Fair Trade program has continued to improve the lives of workers and boost morale on the farms. “We feel the biggest impact, besides the direct benefit of the projects funded by the Fair Trade premiums, is a non-tangible impact of improving the working atmosphere and the sense of empowerment of the workers,” says Crisantes. Wholesum believes that their experience with Fair Trade will spread inspiration to other farms in the U.S. to empower their workers and become Fair Trade certified.